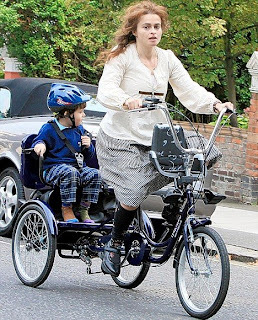 Just a couple of days after Elle Macpherson was seen riding with her son Aurelius on the handle bars, Helena Bonham Carter is pictured London riding safely with son, Billy Ray, 4. Mom and tot are the proud new owners of a midnight blue £750 Trikidoo trike for their daily trips to nursery in Primrose Hill, north London. The fancy bike has a double seat over the back wheels with straps to keep the passenger safely in place.